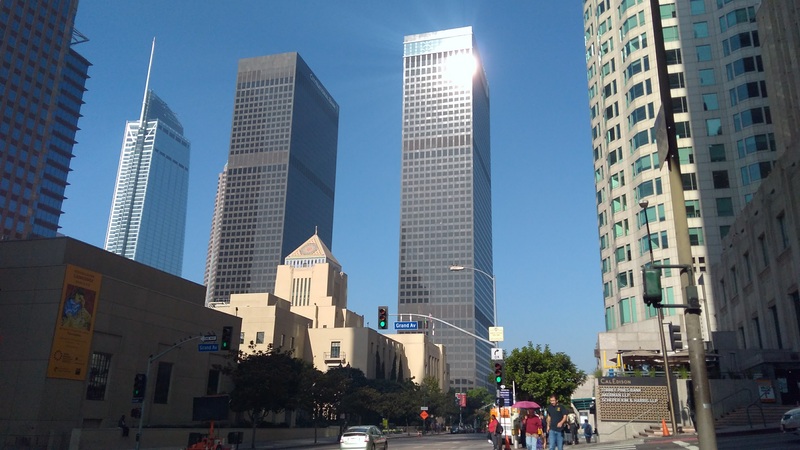 On our second day we had a fun day planned in downtown LA. Rather than deal with California traffic and parking, we were going to take the train into town. It would be cheaper and easier, plus the kids love riding on trains and subways. They really are an underrated means of transportation. So we grabbed some coffee and donuts at the gas station by our motel, and walked a handful of blocks to the train station. Tickets cost a measely $1.75 for a ride anywhere on the train. While we were waiting for our train a stranger struck up a conversation with us. We kind of expected California to be full of unfriendly and busy people, but we were quite delighted to be proven otherwise. The train took a little over an hour to arrive at our stop downtown, but we were happy to not have to deal with traffic or parking. In fact, we got to just sit, talk, and watch the city go by as we drifted easily to our destination. I would definitely travel on a train daily if it were an option. When we arrived downtown we decided to grab one more breakfast item before we got to our scheduled tour. It would be a while until lunch, and we found a bakery that looked too good to pass up. Surprisingly, a film crew also found the bakery too good to pass up. They parked a camera car directly outside of the establishment while a couple of crewman placed orders that they received on their handheld radio. 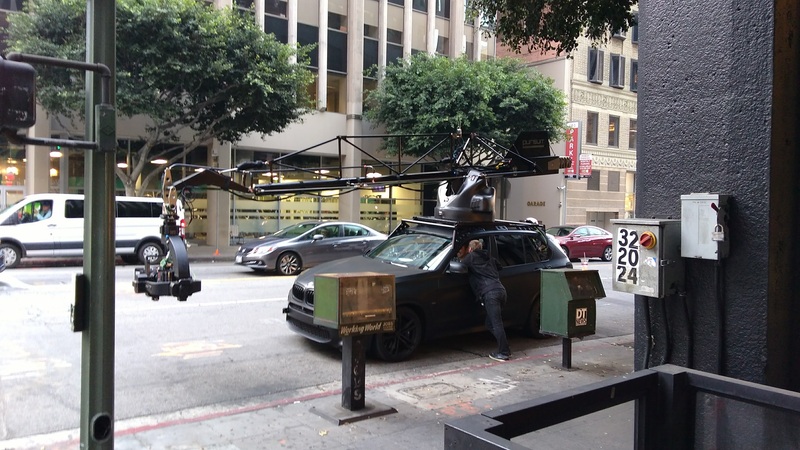 It was pretty neat to see the blacked-out cars and white vans filled with film crews hustling and bustling around downtown. The clerk at the bakery informed us that this was a normal thing for downtown Los Angeles. We arrived a few minutes early for our tour. 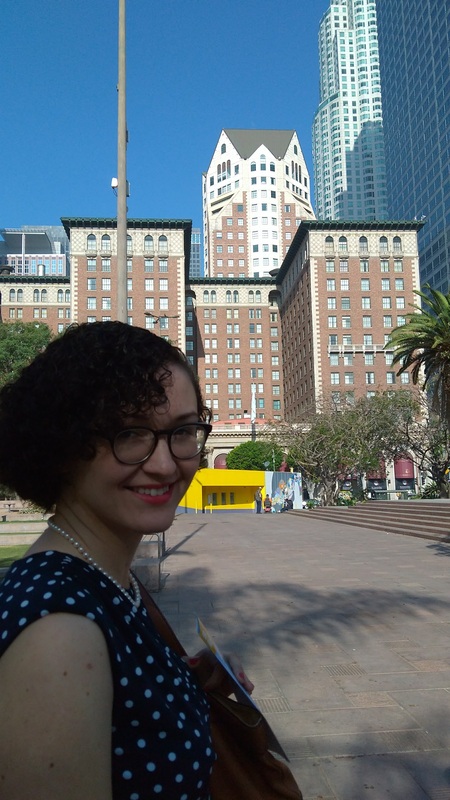 We had scheduled a walking tour with the Los Angeles Conservancy to see and learn about the art deco architecture all across downtown. I won't detail the tour, but it was amazing! So many cool buildings with such a distinct style. I would highly recommend taking any of the tours put on by the conservancy. The tour guide was incredibly knowledgeable, approachable, and they have some fantastic content to share with the world. We finished our tour with the kids being pretty tired and a little bored. (For a tour where we were just looking at buildings, though, they did amazing). We headed to a fun place for lunch that the tour guide recommended. We were a little overwhelmed with the amount of options around us, and she thought that this place would be of interest to us and be pretty fun for the kids. At Clifton's Cafeteria we were greated with boisterous jazz music, dark wood floors, gourmet cafeteria-style food, and a gigantic tree. Cliftons sports three distinct levels dating back over 100 years, united around a gigantic model of a redwood tree. 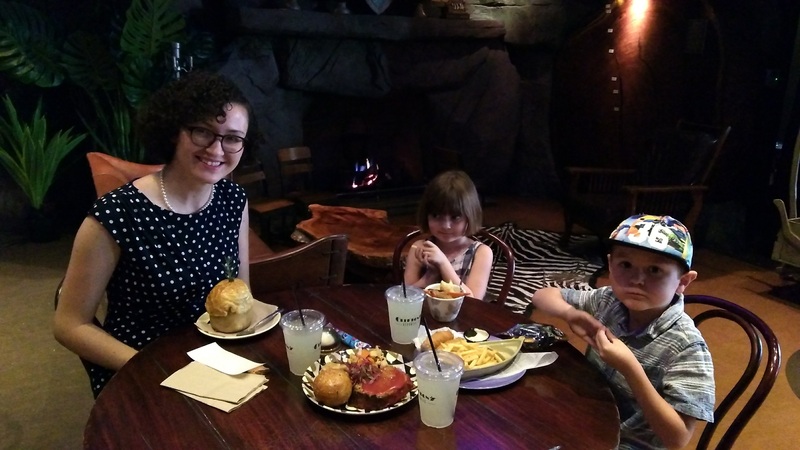 We were able to get a very filling meal of American comfort food for a reasonable price, and the kids got treats and prizes from a treasure chest after finishing their meal. It was quite a unique place, and would be worth a trip back without the kids to check out the bar on the second floor where they had the live music playing. After lunch we headed back for the coast. We weren't done with Santa Monica, yet. As the sun set on the Pacific, we got off the train and walked a short distance to the Third Street Promenade in Santa Monica. It was an envigorating experience of light, sound, food, and shopping. The experience is everything I expected shopping to be in California. 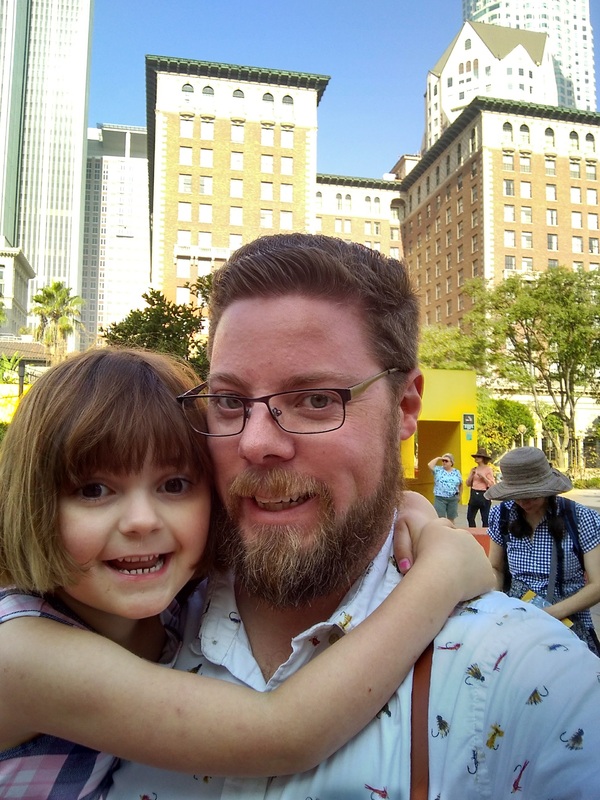 While we didn't buy anything other than a new book for Alex (she couldn't resist the Barnes and Noble), it was so fun to walk the mall with all of the sights and sounds that we associate with Southern California. My memory still swims with neon lights, salty humid breezes, and the ever changing music from the variety of street musicians and dancers. After another long day of walking and travelling all over the metro area, we were beat. We decided to grab some sushi to-go and head back to our palm fortress. It didn't take long for us to polish off all of the delicious fish and collapse on our beds again. We must've walked near ten miles that day, but it was all so much fun.